"Over the years Lido has been a leader in developing technology that makes it easy for the visitor to book on-line. Most importantly Lido has always negotiated the best rates possible and continues to be pro-active in ensuring that the rates available to our clients are the most competitive available." Our innovative online event technology will truly assist in making your event memorable! 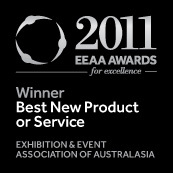 LIDO EVENTS won the award for the 2011 Event & Exhibition Association of Australasia Awards for Excellence for Best New Product in the category for LEADS. This recognition is supported by our vision... to be the most successful provider of integrated accommodation and events content, data and business services to the Australasian region, delivering dynamic solutions via a 100% online environment. Our specialty lies in organising accommodation for events, conferences and exhibitions. Our team will take the stress out of planning where your delegates will stay by providing suitable accommodation options around your event venue. We have access to over 10,000 hotels, apartment style properties, bed and breakfasts and motels Australia and New Zealand wide. In today’s competitive event and conference environment, it is crucial that your attendees experience clear and effective communication. Combine this with our simple and secure online processes your client will be left enjoying a pleasant experience with regards to your event. Australia's most dynamic and comprehensive database of Event based information - from the cricket to city festivals and everything in between.